I compare the 2008 and 2012 surveys to find trends in credit card debt. Among those with medical debt on their credit card (the “medically indebted” for the purposes of my report), average total credit card debt fell from $11,019 in 2008 to $8,762 in 2012, a 20 percent decline. Medical debt alone fell from $2,055 in 2008 to $1,679 in 2012, an 18 percent decline. One likely source of these declines is the Credit Card Accountability Responsibility and Disclosure Act (CARD Act). Studies show that the CARD Act dramatically reduced fees for credit card users. Research by the Consumer Financial Protection Bureau suggests the CARD act reduced hidden credit card fees, saving consumers billions of dollars. Households are also carrying less credit card debt due to out-of-pocket medical expenses and medical debt that is not on credit cards. It’s possible the Affordable Care Act played a role, but many of its key provisions hadn’t been in effect for long enough to conclude that they played a major part in the decline. However, these declines could also be explained by the improving economy. While the situation has become rosier across the board, my research suggests large negative impacts for households that are carrying medical debt. Costly medical procedures can quickly lead to spiraling medical debt, even for households with insurance. Out-of-pocket costs are frequent contributors to credit card debt. 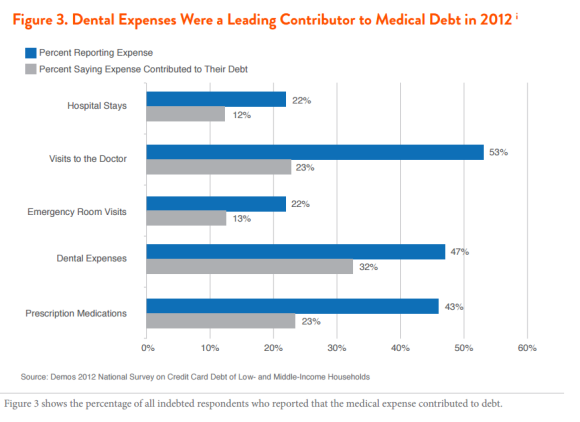 In our survey, dental expenses were the most frequently cited as a contributor to credit card debt; of those respondents who report they experienced a dental expense, a large share said that the expense contributed to their credit card debt. This is likely due to the fact that many basic insurance plans don’t include dental coverage. Emergency room visits, though rare, frequently contributed to debt; more than half of those who reported the expense said it contributed to credit card debt. More than half of respondents reported purchasing prescription medication, and of those nearly half said that prescriptions contributed to credit card debt. Though hospital stays and emergency room visits were not frequently cited as contributing to medical debt (12 percent and 13 percent respectively), that is because few people reported experiencing them (22 percent for both). Among those who had a hospital stay or emergency room visit, 56 percent and 57 percent respectively reported that these visits contributed to medical debt. 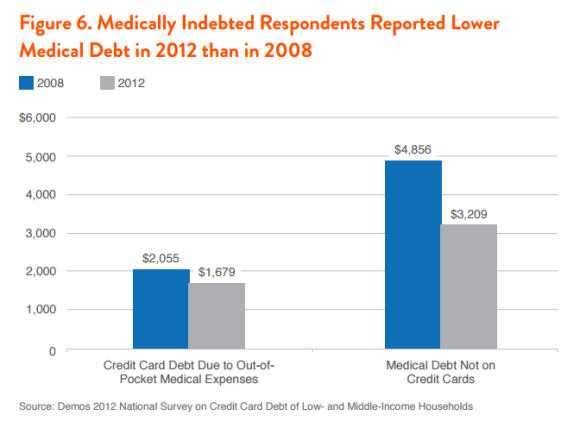 Medically-indebted households also struggle with more credit card debt overall. On average, medically indebted households had $8,762 in credit card debt, compared with $5,154 for households with credit card debt that did not stem from medical expenditures. In addition, households with medical debt on their credit cards were dramatically more likely to report using their credit card to pay for basic expenses, such as rent or groceries, because they didn’t have enough money in their checking or savings accounts (52 percent versus 29 percent). 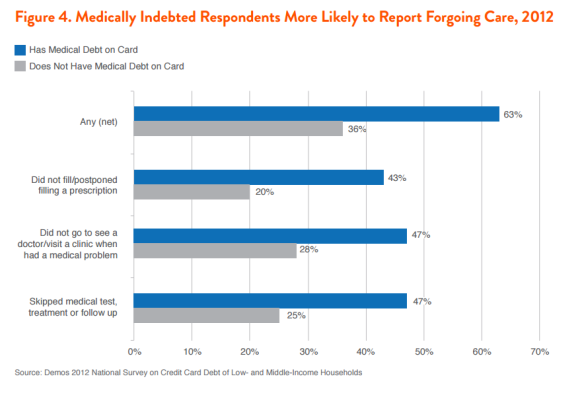 Households with medical debt on their credit cards were far more likely to report forgoing health care to reduce medical expenses. In total, 63 percent of those with medical debt on their credit cards reported either postponing or not filling a prescription, not visiting a doctor, or skipping tests, treatments or follow-ups. Among those not carrying medical debt on their credit card, 36 percent reported these behaviors. The most commonly cited expense that was skipped was visiting a doctor or clinic, a behavior reported by 47 percent of those with medical debt on their credit cards and 28 percent of households without medical debt on their credit cards. A cross-national study finds that Americans are more likely than residents of other high-income nations to skip necessary healthcare to save costs. There are several possible legislative options to reduce the impacts of medical debt. For instance, the CFPB could create protections and a process for consumers to challenge medical debts improperly added to a credit report, or require that individuals be given notice before a debt is added to their credit report. There are also legislative options. The Medical Bankruptcy Fairness Act, proposed by Senators Sheldon Whitehouse (D-RI) and Elizabeth Warren (D-MA), would help families dealing with medical debt keep their homes by providing them with bankruptcy protection, and would forgive student debt. It also waives the unnecessary and offensive requirement that individuals who file for debt relief receive credit counseling, if the debt is medical-related. The Medical Debt Responsibility Act, introduced by Senator Jeff Merkley (D-OR) and Rep. Maxine Waters (D-CA), would require that fully paid medical debt be removed from credit reports within 45 days. These smaller reforms would have big impacts on many households, but there are also bigger potential reforms. Although the Affordable Care Act is an important piece of legislation, it still leaves many Americans uninsured. A public option, by acting as an insurer of last resort, could close that gap. In addition, a public option would be in a strong position to negotiate with healthcare providers, driving down costs. Research finds an estimated “reduction in collection balances of around $600 to $1,000 among those who gain Medicaid coverage due to the ACA.” This suggests that if more states expanded Medicaid, it would also alleviate medical debt. Although insurance doesn’t prevent medical debt from ruining lives, there is evidence that it reduces the incidence of medical debt. In a recent op-ed, President Obama argued for a public option. A medical crisis can strike a household at any time — it shouldn’t drive them into bankruptcy or poverty. In other wealthy countries, it rarely does. Another painful example of American exceptionalism.